It’s tough to beat the 2014 Honda Odyssey. With a bold look that puts other minivans to shame, the Odyssey is easily one of the best picks in its class, putting it ahead of other family vans like the 2014 Toyota Sienna. So what exactly sets the 2014 Honda Odyssey apart from the 2014 Toyota Sienna? Here’s a close look at how they match up. Both the Odyssey and the Sienna come standard equipped with a V6 engine with comparable strength (the Odyssey delivers 250 hp while the Sienna delivers 245 hp). There is a bit of a difference in the fuel economy, though. When it comes to a larger car like minivan any bit of fuel savings can make a huge difference. In the city, the 2014 Honda Odyssey gets an EPA estimated 19 mpg and 28 mpg on the highway. * The Sienna on the other hand, maintains an estimated 18 mpg in the city and 25 mpg on the highway. While this may not seem like a huge difference, think about how much gas you could save over the many years of ownership. Then there are the many things about the Odyssey that set it apart from the Sienna. For instance, all Odyssey models come standard equipped with a rearview camera, while the Sienna does not. A rearview camera can help you to get a clearer look at what’s behind you, whether its other vehicles, children, or pets. And while we can go on about specs and fuel economies, there’s no way to really do justice to one of the Odyssey’s most notable aspects: its comfort factor. 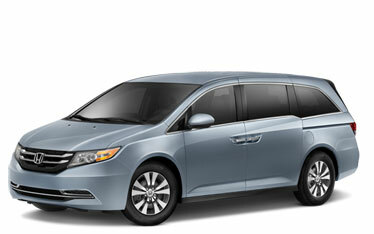 We invite you and your family to stop by our dealership and see how great it feels to sit in a smooth riding minivan. Visit Middletown Honda at 520 Route 211, just a short drive from Mechanicstown and many other communities around the OrangeCounty area. If you have any questions about any of the models we have in stock or financing, please don’t hesitate contact our dealership. Our team is here to help you to pick the perfect car for you and your family. * 19 city/28 highway/22 combined mpg rating. Based on 2014 EPA mileage ratings. Use for comparison purposes only. Your actual mileage will vary depending on how you drive and maintain your vehicle.